RRich Redmond is an influential drummer, having toured and recorded with the likes of Ludacris, Kelly Clarkson, Bryan Adams, Joe Perry, Chris Cornell, and dozens of others. As the drumming powerhouse behind Grammy-nominated Jason Aldean, Rich has recorded 23 #1 singles with sales over the 10 million mark. Also a successful entrepreneur, speaker, educator, and an actor, Rich truly knows how to laser focus on his goals and to be one of the most prolific people in the business. 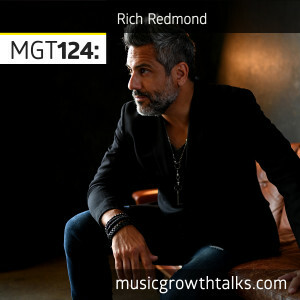 On this Music Growth Talks episode, Rich shows how he’s not only survived in the music industry, but has been thriving in it. He talks about building multiple income streams as a musician, such as teaching and offering speaking engagements to corporations. Rich also explains his “C.R.A.S.H. Course For Success”™ presentation, which he refers to as “edu-tainment.” C.R.A.S.H. is a practical concept, applicable to Fortune 500 companies and music artists alike. Listen to the episode in full to hear time management tips from the person who juggles an insane amount of projects, to learn why Rich encourages all aspiring musicians to move to music hubs like Nashville or Los Angeles (the two cities he resides in), and to hear an unexpected speculation on the question: do we really need music? Email 1225entertainment at gmail dot com if you are interested in the offer Rich mentions on this episode.